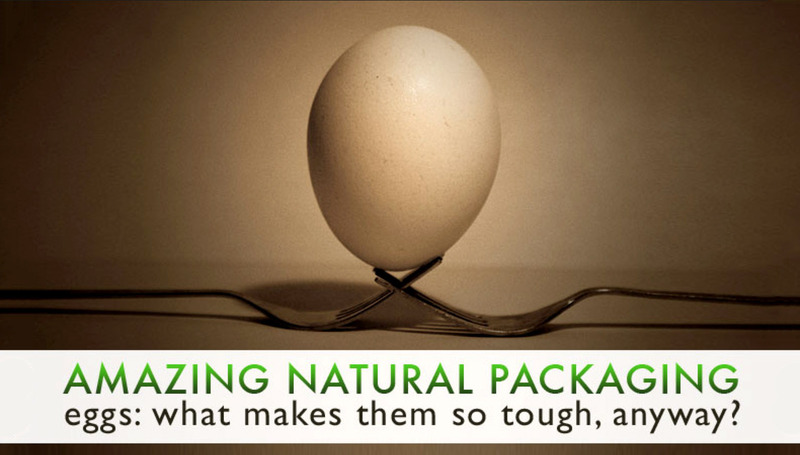 Amazing Natural Packaging: Eggs - What Makes Them So Tough Anyway? 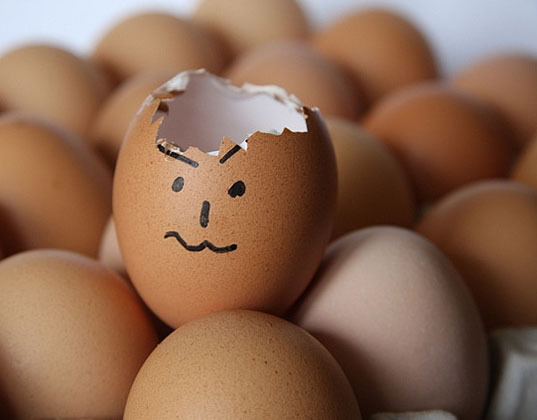 Amazing Natural Packaging: Eggs – What Makes Them So Tough Anyway? However you feel about eggs – love ’em fried with onions, hate ’em in anything, or are morally opposed to consuming them at all – one thing you can’t argue about is that they are an incredibly effective package for embryonic animals of all kinds. They are so successful, in fact, that female animals as diverse as birds, fish, reptiles, and amphibians all evolved eggs to mature their young outside their bodies, which presents a number of evolutionary advantages (and some disadvantages; namely that mammals, especially, like to eat eggs). Snake emerging from its more leathery and less hard shell. Image via Rouwkema/Flickr. 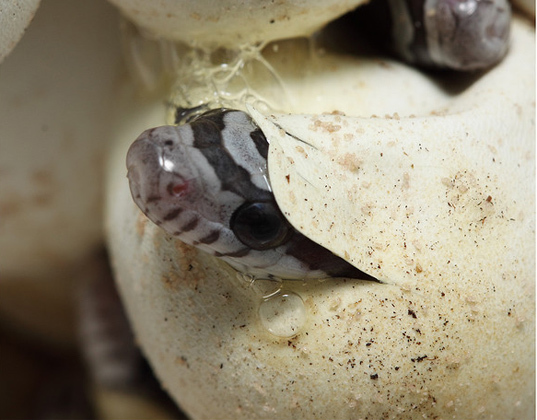 Unlike the soft-but-tough exteriors of snake eggs, or the jelly-like clusters of amphibian eggs (which serves them perfectly in their watery environments), I have always wondered about the hard-sided eggs of land animals, especially birds. They are extremely thin, very tough, and also able transmit heat but keep moisture out and in. Is it the shape of the egg, or the composition of the shell that makes them so tough? Photo via Nina Matthews Photography/Flickr. The answer is as complicated – and ingenious – as you might expect from millions of years of trial and error. The shape of an egg is almost a prolate spheroid, though like many things in nature, it is slightly asymmetrical, with a smaller top than bottom. It is the arch shape at top and bottom that makes eggs particularly strong. Just like Roman aqueducts have proved, an arch is one of the hardest shapes to break, and an egg’s shell is essentially two connected arches. But this classically strong (not to mention beautiful) shape is not the only part of an egg that makes it both graceful and strong. It’s also what the shells are made from. When it comes to materials, eggshells are about 95% calcium carbonate arranged in long chains (with phosphorus, magnesium, sodium, potassium, iron and other trace minerals rounding out the rest). But while this can be a tough substance, it’s just a crumbly powder unless it’s held together properly by the underlying mineral matrix that gives the calcium structure. It is a beautiful, tangled network, more like a neural network or tangled bunch of hair than a fence-like matrix. Eggshells do compost, though it happens pretty slowly — as any active composter knows. But the high calcium content of eggshells means that they function a bit like ‘calcium nuggets’ and therefore don’t need to be fully broken down when added to your garden bed or flower pot. As they break down, they contribute this beneficial mineral to the soil. Eggshells can also be added to water to make an ‘eggshell tea’ that can be used for plants or houseplants (let the eggshells soak for a couple days and use the water for your plants). 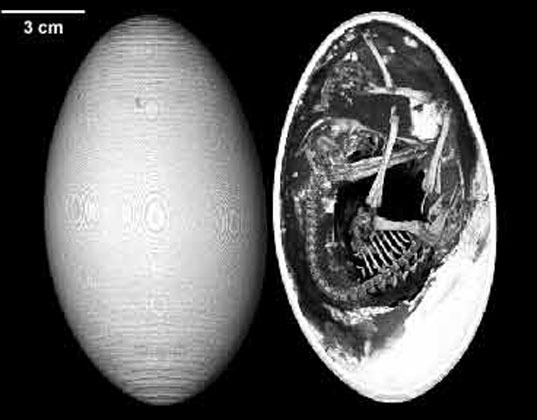 Photo of an fetal emu inside its egg, via University of Texas/Austin. So there you have it; one of nature’s most supportive shapes, paired with a naturally hard mineral laid out in a matrix that makes it even tougher. So what if the eggshell‘s attributes could be used to package delicate items? What if we could create a material that could protect its contents as well as eggs do? One that is not only biodegradable, but could actually help add minerals and nutrients to the soil like eggs. And what if it could all be made in a low-energy system (maybe not a chicken!)? Starre Vartan is founder and editor-in-chief of Eco-Chick and author of The Eco-Chick Guide to Life (St. Martin’s Press). A green living expert, she contributes to The Huffington Post and Mother Nature Network (MNN.com).